Baltimore Vegan Drinks: Land of Kush! 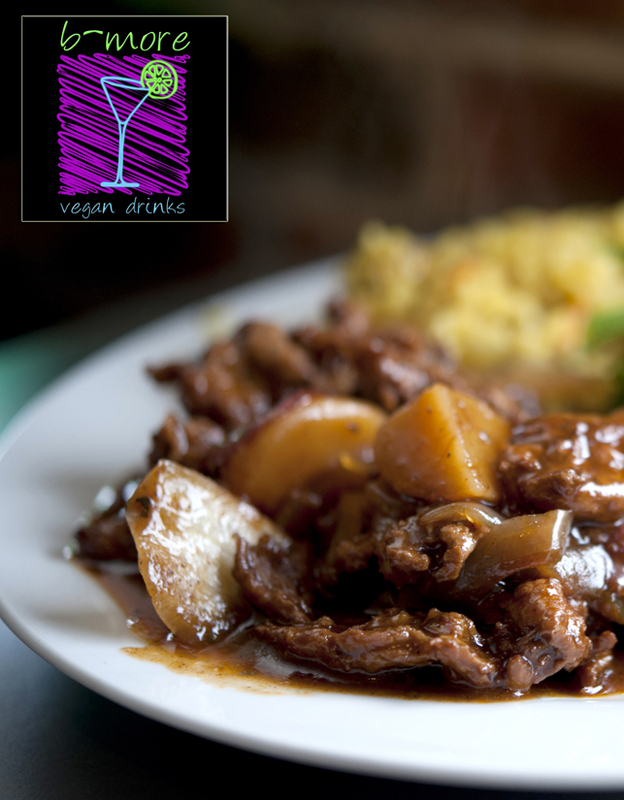 It may be a rainy night in Baltimore, but here’s something to do… tonight is Baltimore Vegan Drinks at The Land of Kush! The place will be hoppin’ from 7pm to 9pm. 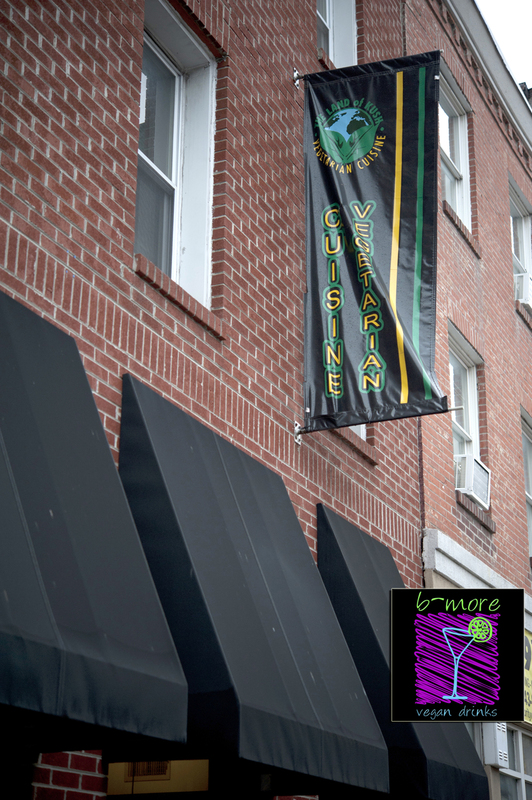 Stop by 840 N Eutaw St Baltimore, MD 21201. It’s free to get in and the vegan mac and cheese there is the stuff of legends… Oh and they will be serving local beer & wine, as well as having an eggplant quesadilla special. 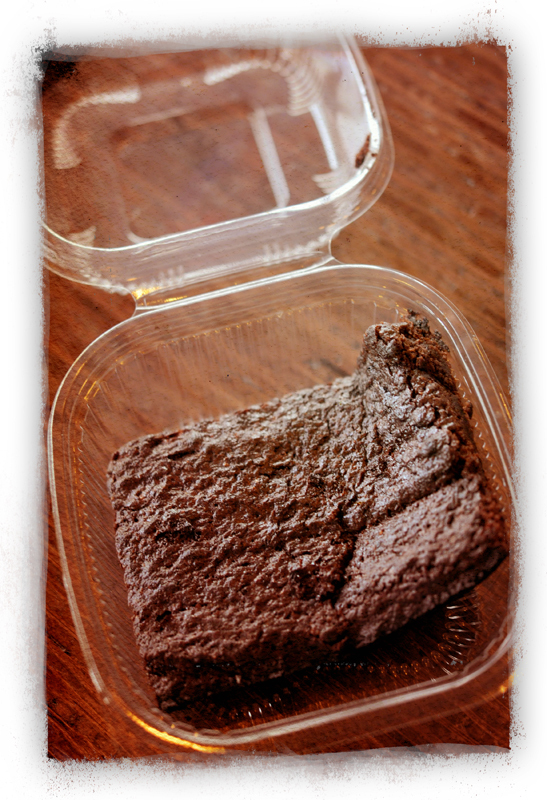 The door prize is a batch of delish vegan brownies from Dudley’s Desserts in Columbia. 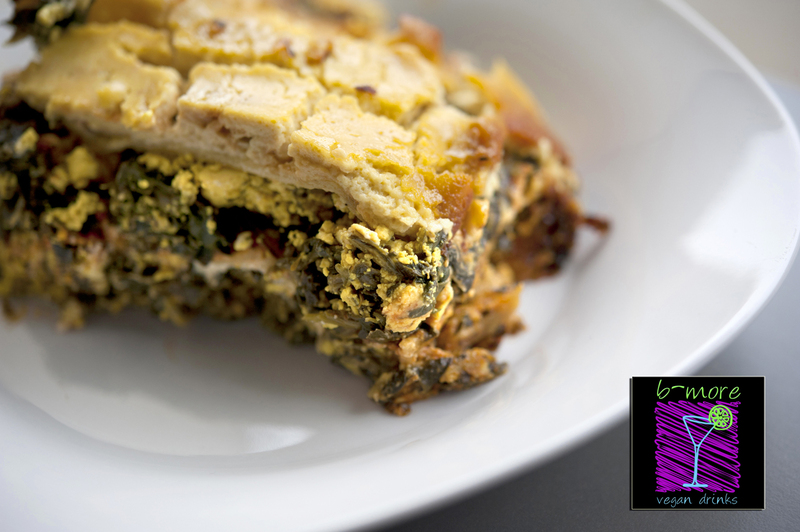 Pictured below… Land of Kush‘s Un-Ribs with Seasoned Rice; Raw Kale & Garlic Salad; and Spinach Lasagna. Right on! Bring an umbrella and we will see you there! It’s about this time of year when I start dreaming of warmer weather. Not just slightly warmer. I’m not talking a change of 12-degrees to a balmy 35-degrees. No. I’m talking warmer weather. Like crystal blue waters, palm trees, fresh coconuts. You know, like Key West, Florida. Let’s get one thing out of the way immediately. When we told folks we were going to Key West (we went for work – yeah, yeah, I know, tough life), everyone said “Oh, it’s soo touristy,” and “There are too many people drinking,” and “It’s not as nice as other tropical paradises.” To this I say REALLY? Cuz we were there and it wasn’t any more or less touristy than any other resort (maybe less than some places, actually); and sure there were folks drinking. But you can say that about Baltimore 365 days a year. And as far as Key West “not being as nice as other tropical paradises…” Hmm, all I can come up with is that those silly people were jealous because we were, in fact, going to wake up and go take photographs in a freaking tropical paradise while they went to an office in Maryland. Haters. 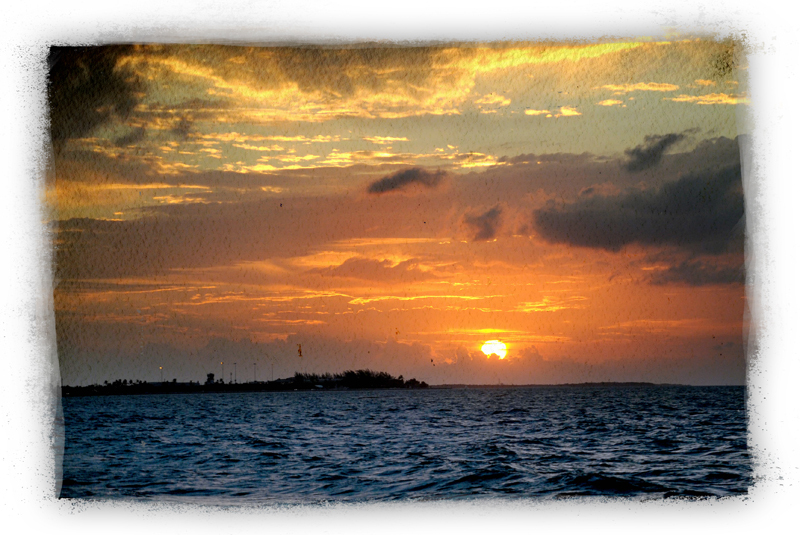 Key West was stunning, gorgeous, breath-taking and beautiful. Having walked the streets, felt the warm Caribbean breeze tousle my hair and sipped fresh coconut juice right from the shell, I totally understand why Ernest Hemingway and Jimmy Buffet had strong ties to this idyllic island. To make this even better, we found Key West to be incredibly vegan-friendly. Eating in this small resort town was seriously easier than eating in Ocean City, MD! No joke. We felt immediately relaxed at The Cafe. There were signs out front announcing their veg-friendly options (more than 20 on the menu – though it’s not a strictly vegetarian restaurant). Gotta love a place that posts “BBQ Unwing Dings” in the window. The inside was quirky and arty, and our servers were very helpful. Our first meals there were a falafel pita and a curried “chicken” salad sandwich, served with marinated bean salad. These were both super tasty and filling! The falafel came on a toasted pita with hummus, tahini sauce, cucumbers and Israeli couscous. And the curried “chicken” salad was piled high with veggies on a ciabatta roll. The “chicken” salad contained soy “meat”, toasted almonds, grapes, and shallots. In combination with the zingy curry sauce, these ingredients were a winner and the lettuce, tomato and sprouts were piled so high, it seemed like a side salad. Because our sandwiches were quite huge, we each only ate half, and packed up the bean salads as well. This made for a terrific snack later in the evening. But we fell in love with The Cafe just that fast. And we came back. 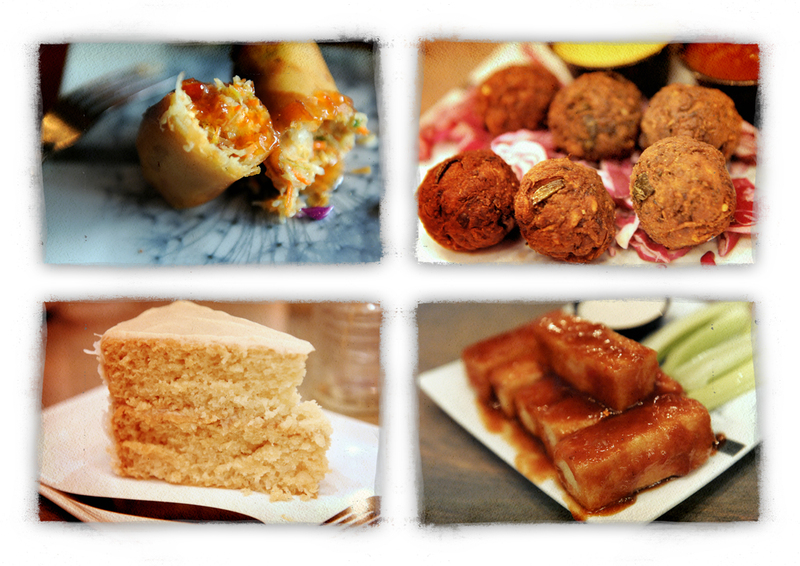 Wanna see a few more of the tasty treats we had at The Cafe? During additional visits we had Spring Rolls with Sweet Chili Sauce (served warm – they’re crispy and loaded with cabbage and carrots); Un-Wing Dings with BBQ Sauce, served with celery & Tahini sauce (one of The Cafe‘s signature dishes – very moist, chewy & yummy – a perfect late night snack! ); vegan Coconut Layer Cake (this was fresh, tender and packed with coconut – we wanted to lick the plate); and another signature dish, Cafe Veggie Burger Bites (these are house-made with legumes, carrots, broccoli, mushrooms, scallions and sunflower seeds). A vegan feast, to put it mildly! Even better, The Cafe also served a variety of organic wines, homemade iced chai tea with soymilk, fresh juices and locally roasted coffees. During our stay in Key West, we didn’t get to sample every vegan offering from The Cafe, which was a bummer. But you can. Be sure to try the Spinach Dumplings, Sweet Potato Fries, Wok-Fired Bok Choy, Grilled Tofu Salad, Colossal Veggie Sandwich, Baked Brown Sugar Acorn Squash and Peanut Stir Fry with Soba Noodles. They sounded so good! 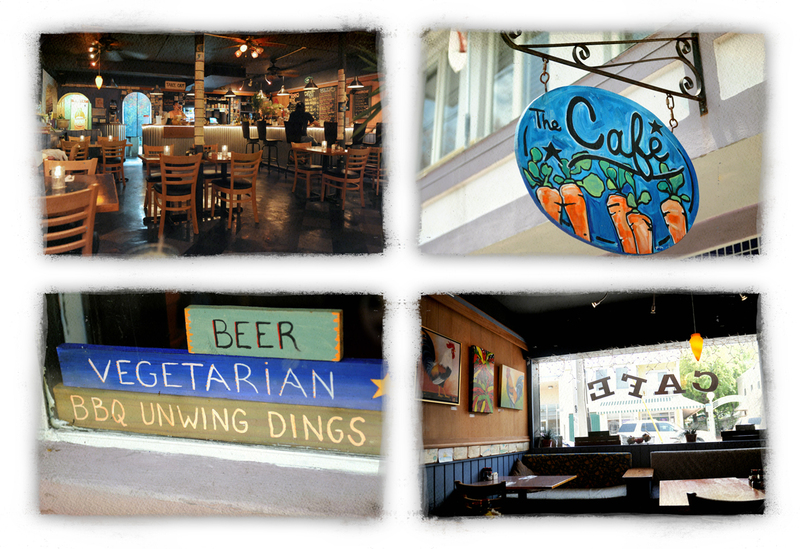 Again, The Cafe is located at 509 Southard Street, Key West FL; (305) 296-5515. They’re closed on Sundays. On Duvall Street, we found a great little watering hole called lush, which was nestled inside a store called The Green Pineapple. Both were stellar. The deal at lush is that all items served there are certified organic, sustainable, recycled, compostable, biodegradable, renewable, socially & ethically responsible, and fair trade certified. 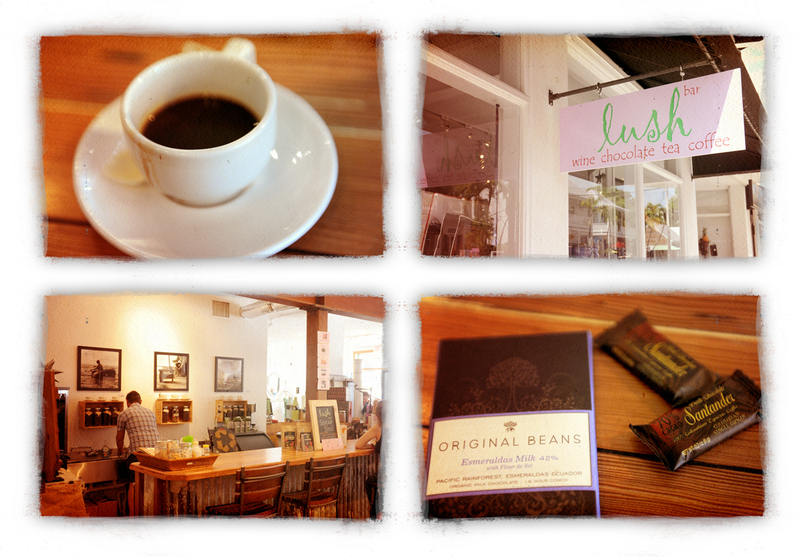 The espresso was smooth and rich, and the owner of lush, who was working the bar, suggested two bites of dark vegan chocolate, 70% cacao, to pair with the coffee. And if you’ve read this blog more than once, you know we LOVE chocolate. We also picked up a non-vegan milk chocolate bar as a gift for a friend. She later told us it was among the finest chocolate she has ever tasted in her life. Like all the chocolate at lush – exquisite and upscale. 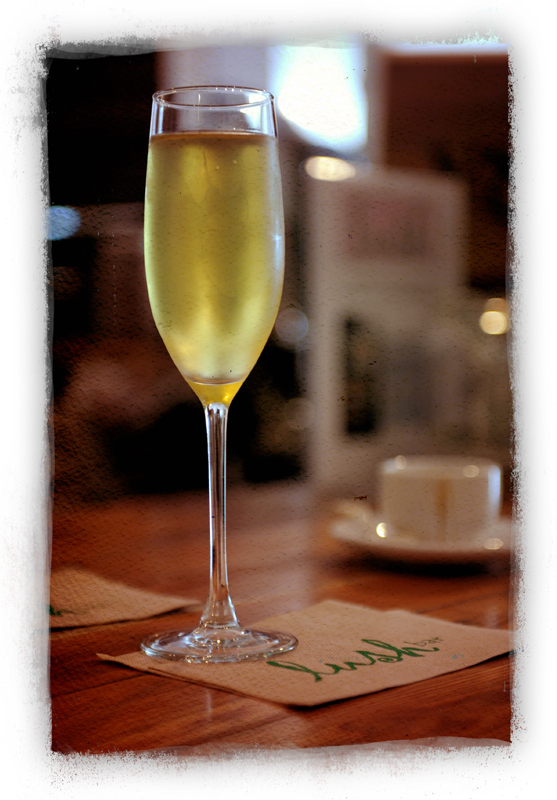 For me, the drink of choice was chilled pineapple green tea in champagne glass. It was as elegant as it looked. Maybe the word was sublime. I could barely get up from the bar to go browse around the Green Pineapple, I didn’t want to leave my wonderful tea. But it was worth it, as the shop held many eco-friendly treasures: handmade jewelry, upcycled decor and other goodies abound. My favorite was a set of soy candles poured into vintage tea cups. lush and The Green Pineapple are located at 1130 Duval Street, Key West, FL 33040; (855)ITS-LUSH. Be sure to check their Facebook page, too, as they have regularly scheduled wine and chocolate tastings – absolutely worth fitting into your trip! 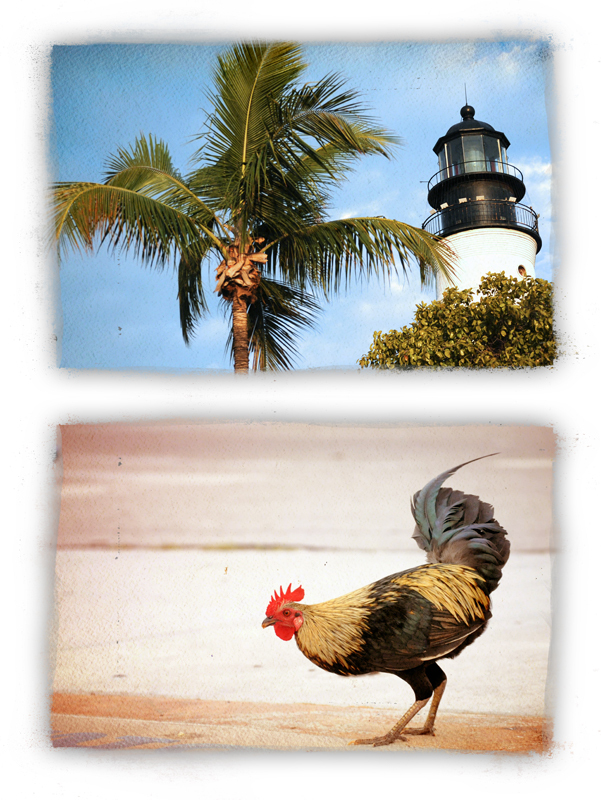 One thing we learned in Key West was that breakfast – vegan or otherwise – is not easy to find. Most folks like to sleep in, except for the chickens, of course. Our first few mornings, we were happy with fresh fruit for breakfast. But Help Yourself Cafe was our salvation. They open at 8am every day and had an excellent morning selection, including smoothies and a fresh juice bar. For our lovely breakfast at Help Yourself Cafe, we tried the Sprouted Whole Grain Bagel with Cashew Cream Cheese, Tomatoes and Avocado. I have to stop here to add – they make these bagels and cashew cream cheese on the premises. They were so damn good. I could have eaten a dozen. Next we tried the Tempeh Breakfast Wrap. It was jammed with veggies and housemade salsa, and tasted divine. Finally, we shared a Power Bowl – which is slow-cooked oatmeal with flax seeds, chia seeds, hemp seeds and goji berries, finished with a drizzle of maple syrup. Talk about comforting and hearty! After this bowl of oats and seeds, we weren’t even hungry for lunch. The juice bar is a new part of the Help Yourself Cafe and opened in April 2012. 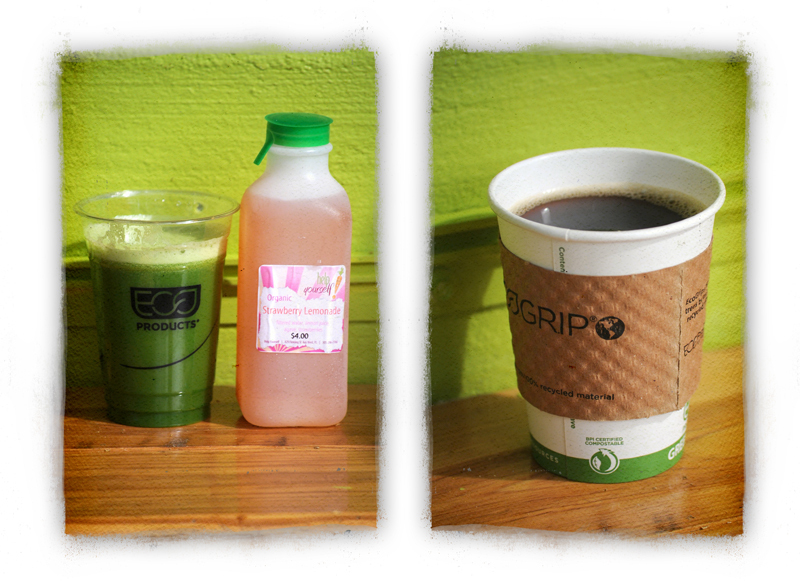 We tried a green juice, with kale and cucumbers and ginger, as well as some bottled fresh strawberry lemonade. Both were terrific and refreshing. Their coffee was fair-trade and organic – brewed to perfection. One of the best parts about the Help Yourself Cafe was their green philosophy. 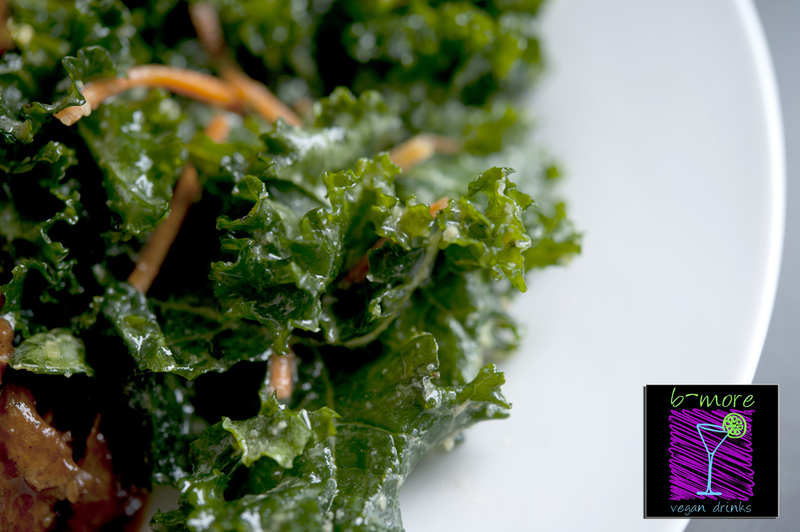 Every item on the menu is made from scratch using non-GMO, organic ingredients. They don’t use refined sugars, refined grains or unhealthy fats. Plus there’s a great little store attached to the Help Yourself Cafe. You can pick up to-go meals & juices, eco-friendly toiletries, organic fruits & veggies, plus healthy snacks, tea/coffee, pantry items and more. While not 100% vegetarian/vegan, the staff here does know their stuff. Sadly, we only got eat one meal at the Help Yourself Cafe. They had lots of enticing menu offerings though, including Indian Summer Salads with chickpeas, raisins, quinoa, and curried cashews over greens; English Garden Wraps with mixed raw veggies, garden herbs, pesto and mixed greens; Asian Zucchini Noodles and Hot Coconut Curry – available with brown rice, quinoa or udon noodles. Delish! 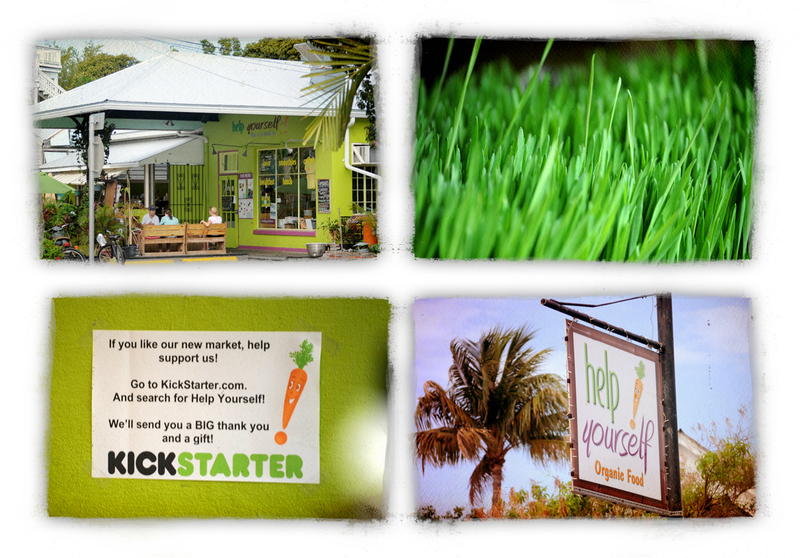 The Help Yourself Cafe is at 829 Fleming Street, Key West, FL 33040; (305) 296-7766. Oh – and they have a parking lot with free parking and in Key West, this is seriously worth noting. We had another wonderful lunch at Sugar Apple Juice Bar & Veggie Deli. It was all vegan store and cafe, but sadly, we didn’t have our cameras along for this meal – we had left them at the job site where we were working. But the good news is that we had a great meal here, and you can too. The Dirty Hippie tried their FLT sandwich – Fakin’ Bacon, Lettuce & Tomato on whole wheat bread with vegan mayo. He also got a side salad with this absolutely amazing key lime vinaigrette. The vinaigrette was made in-house and is totally worth taking time for on your visit to Key West. It tastes like someone just picked the key limes moments before handing you the salad. Heck, maybe they did. I tried a dish from the special menu, Pesto Rice. It was brown and wild rices with a tangy basil sauce and pieces of tofu. Again, this dish was hearty and flavorful – the vegan basil-pesto sauce was really complex. I’d eat it again right now. 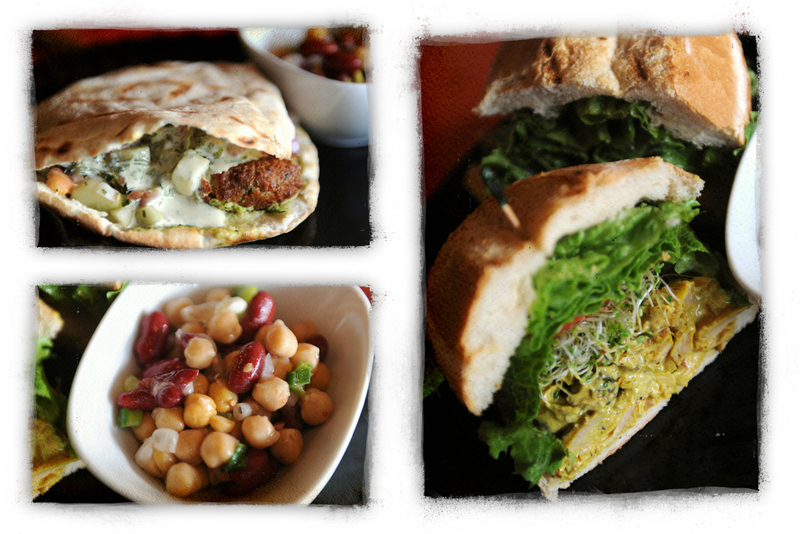 The cafe at Sugar Apple had solid vegan offerings for lunch – stuff like Eggless Salad Sandwiches, Italian Veggie Sausage Sandwiches, Hummus Wraps and Tempeh with Tahini Sauce. Their food was filling and reminded us of home, somehow. Sugar Apple’s Juice Bar was also delicious – we had carrot-celery juice with spirulina. Yum. We also did a little shopping at Sugar Apple, finding goodies we needed, like natural sunscreens, vitamins (duh, we left ours at home) and familiar vegan snacks like Larabars. 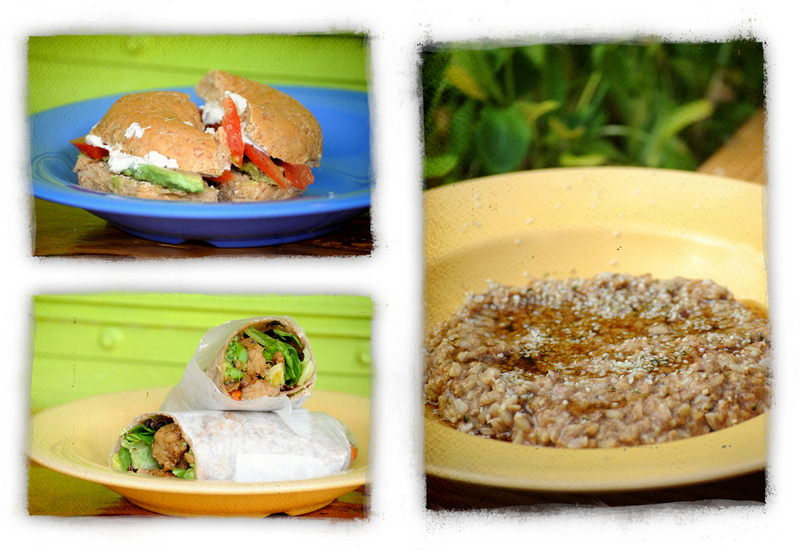 You can find Sugar Apple Juice Bar & Veggie Deli at 917 Simonton Street, Key West FL 33040; (305) 292-0043. They also have a parking lot with free parking. Woo-hoo! Alas, it came time to leave Key West. We had flown into Ft. Lauderdale and had hoped to stop at the legendary Sublime before leave town. But they were closed, so we peeked in the windows and left. All ended well, though, because we found Pizza Fusion. This small chain of pizzerias is devoted to sustainability (check out this eco-philosophy page!) and are PETA-approved! 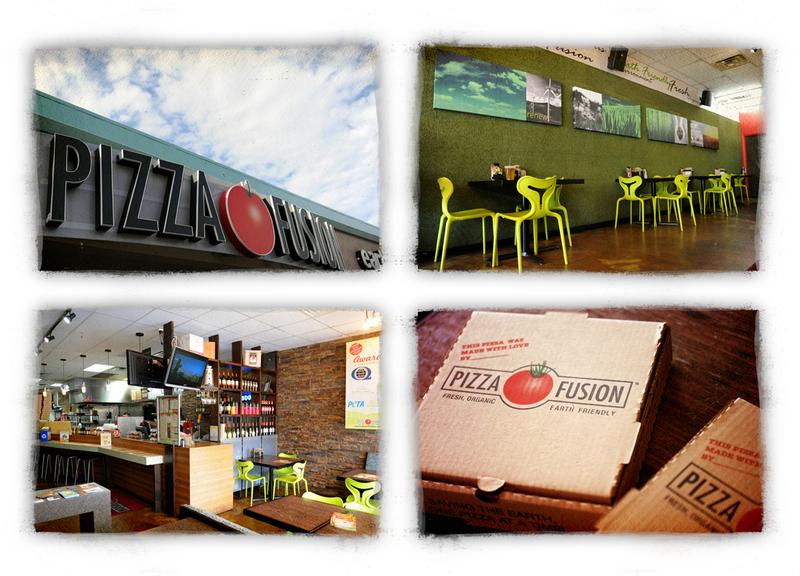 Pizza Fusion is proud of their vegan options, as well as their gluten free choices and show them off online. We were impressed with the eco-friendly interiors – repurposed wood, recycling bins, compostable cups. This place was the real deal. While we waited for the pizzas, we shared a Fusion House salad: arugula, romaine, cucumber, red onion, tomatoes, basil, carrot ribbons and crostini. The menu says that “No houses were harmed in the making of this salad.” Hee hee. 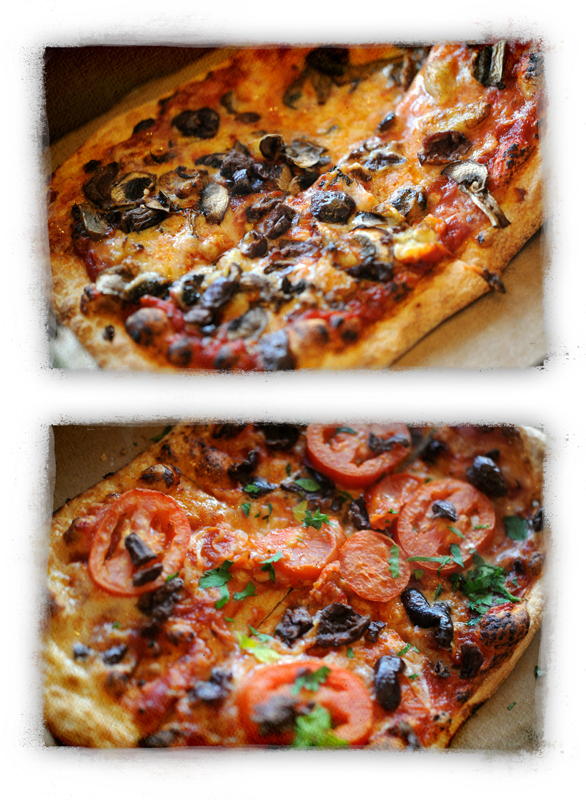 Then we got to the good stuff… A Greek Pizza with Kalamata olives, sliced roma tomatoes, tomato sauce, Daiya and parsley and a Very Vegan Pizza with Crimini mushrooms, roasted garlic, tomato sauce and Daiya. Holy awesome vegan pizzas, Batman. We seriously considered how we could order more and check them with our luggage. The crust was so good – crispy and fresh. And there were many, many more options on the menu for vegans. It was hard to decide! Wish there was a Pizza Fusion in Baltimore! We loved the house-made iced tea. It had subtle sweetness and was certainly fresh-brewed. 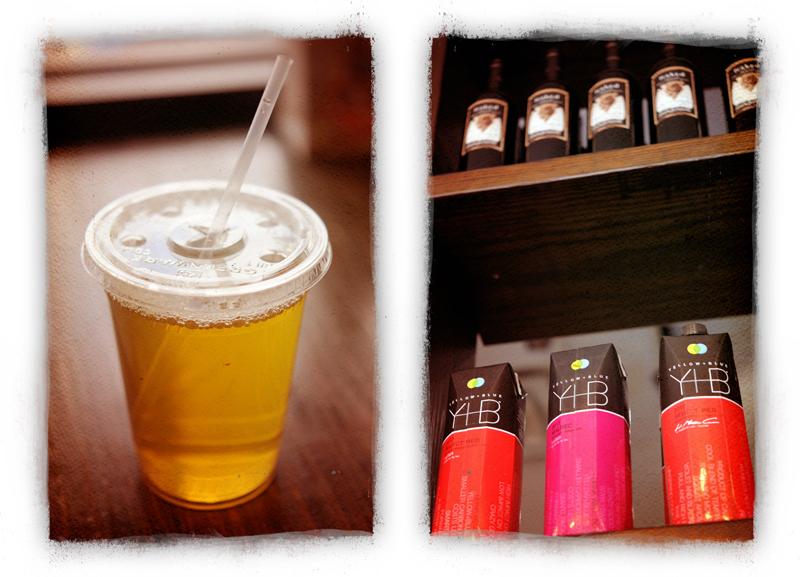 They also had organic wines and our Maryland fave – Honest Tea! One more thing needs props from Pizza Fusion. The vegan brownie. It was soft, chocolate-y, moist and gooey. It was everything a vegan brownie should be. Plus, it was gluten free and bigger than your hand. The server told us they sell out of these heavenly things pretty often. And no wonder… just look at it! Can’t you imagine sinking your teeth into that square of delight? Sigh… at the moment I am looking out my window at bare trees and neighborhood children bundled up in scarves, mittens and thick winter coats. There are no swaying palms. No random chickens on my street and certainly no coconuts fresh from the trees. It’s great when family and friends accept the vegan choices we make. It’s especially exciting when they go all-out and make vegan food for family functions! The Dirty Hippie’s aunt recently made a delicious vegan dip. 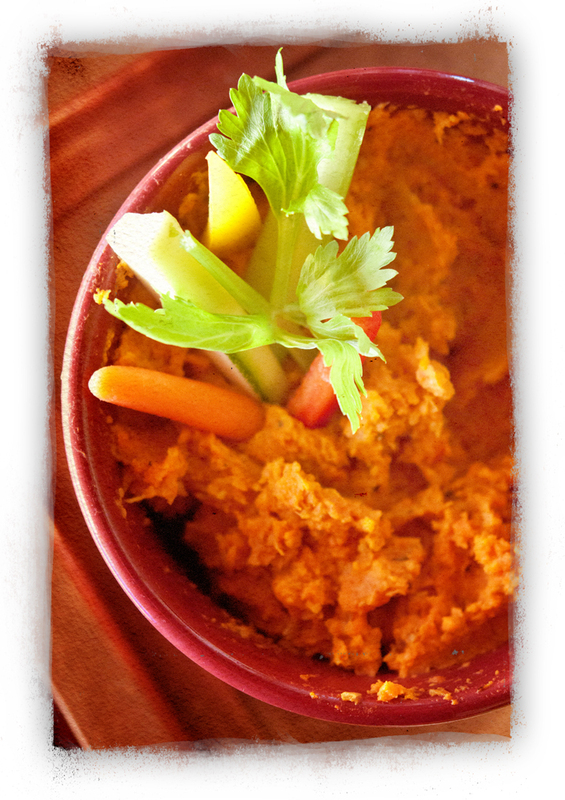 Aunt Rosemarie’s Roasted Veggie Dip was a hit with everyone – vegans and omnivores alike. Even the kids liked it! After all, who can resist roasted carrots, sweet potatoes and onions with a savory dash of herbs? Preheat oven to 375. Toss carrots, sweet potatoes and onions in olive oil in a large baking dish. Spread out on a single layer so they bake evenly. Sprinkle with garlic, thyme, oregano, salt and pepper. Bake uncovered 45 to 60 minutes, until veggies are tender when poked with a fork. Cool veggies about 10- 15 minutes before transferring to a food processor. Blend until smooth enough to be a dip, but don’t over process, or you will end up with soup. Can be served warm or cold with crudite such as baby carrots, celery sticks, zucchini sticks, baby tomatoes, radishes and pepper wedges or smeared on crackers or baguette slices. This dish travels well and is great for sharing! Thanks Aunt Rosemarie! We loooove this wonderful dip! Something about chocolate truffles just says decadent. Which makes them the ideal gift for a Valentine. You can definitely find vegan truffles for sale nowadays. But how romantic would you be if you made some? Yea, baby. That’s right. 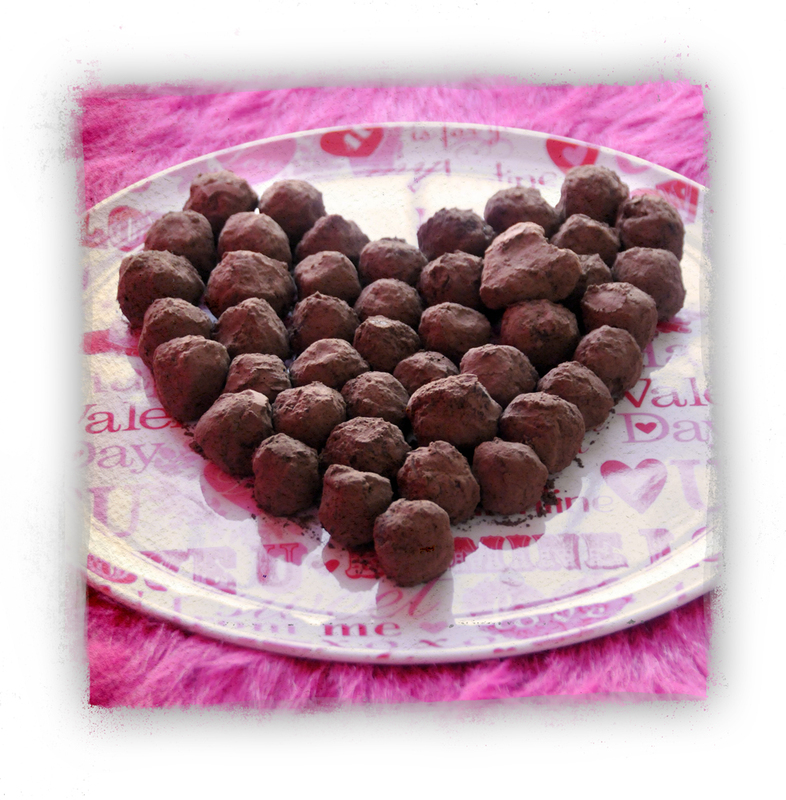 There are many much more complex ways to go about creating vegan truffles. And I say, let them to the professionals. This vegan truffle base is delicious, and while you will still need to bust out the double boiler, it’s much easier than other attempts we have made with longer ingredient lists. We note below that are are two ways to coat your truffles. For us, the roll in cocoa powder is sufficient. You can also roll them in chopped nuts, coconut flakes, sugar crystals – you get the idea. But if you’re going after the *wow* you may want to try the second method, which involves dipping them in chocolate to create a hard candy shell. It’s quite fancy and any guy/gal not blown away by this effort is clearly not worth your time. There are two coating options for any type of truffles… if you haven’t already eaten them as-is! The first option is the easier one – roll the finished balls in cocoa powder, chopped nuts, vegan graham cracker crumbs, shredded coconut, sprinkles, sugar crystals, powdered sugar or chocolate shavings. And that’s it! Store in a cool place and serve at room temperature. The second option is to coat the truffle in another layer of chocolate. To do this, chill the rolled truffles again, or even freeze them. Once they are really cool, add 16 oz. of semi-sweet or dark chocolate chips to the top level of a double boiler. If the chocolate gets thick, add a teaspoon of vegetable oil or shortening at a time, to thin it out and make the coating chocolate glossy. Once the chocolate is smooth and melted, use a fork to dip the cooled truffle centers into it. Place them on a cookie sheet covered in parchment paper. If you want to add decoration to the coating chocolate, like sprinkles or cocoa, be sure to add it to the truffles while the chocolate is still wet, or it won’t stick. Once the entire batch is done, let the 2nd layer of chocolate firm up in the fridge. If you are giving these as a Valentine’s Day gift, be sure to present them in a pretty box or on a cute platter to your Sweetie. Imagine you have, like, no baking skills and still need to make an awesome vegan dessert. Maybe for your Valentine. Or just for yourself, to eat while watching movies this weekend. Whatevs. Don’t worry about it. We’ve got you covered. Combine drained tofu, maple syrup, vanilla, peanut butter and arrowroot powder in a food processor or blender. Mix until very smooth and well incorporated. Pour into pre-made graham crust pie shell and chill overnight. 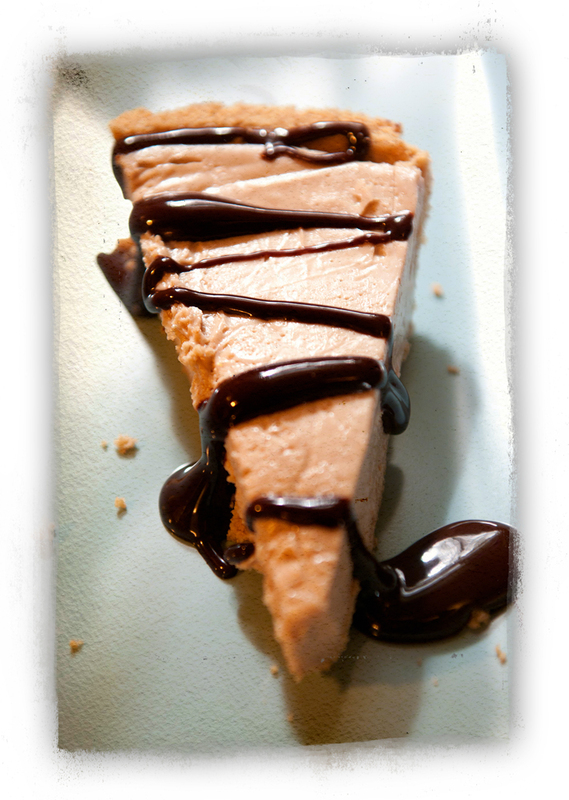 Serve cold, garnished with chopped nuts and/or drizzled chocolate sauce.